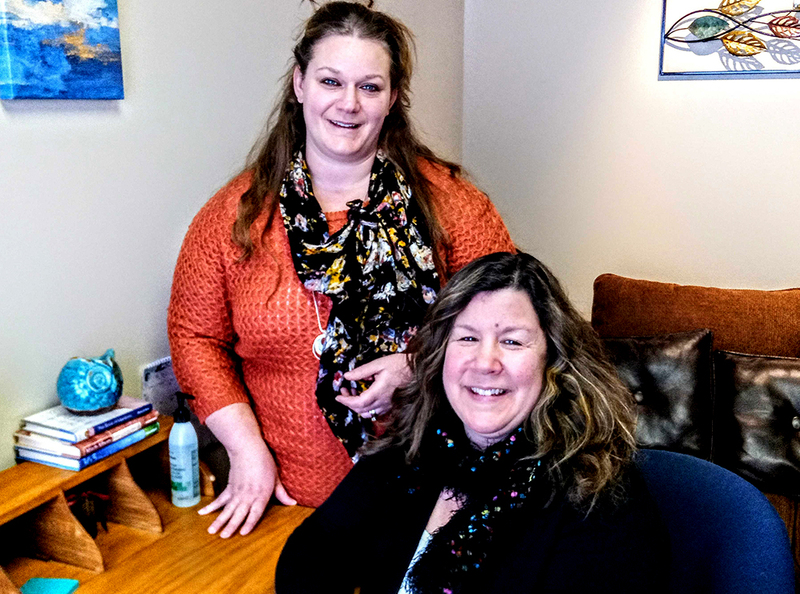 Kristine Karig, LMHC, seated, and Krystal Gleason, LMHC, operate Turning Leaf Counseling Services, where people can get assistance with a variety of mental health issues. With the new year, many people are making resolutions to live a happier, healthier lifestyles. While that is often connected to physical health, the connection between physical wellness and mental health has come to the forefront. Turning Leaf Counseling Services, at 5 Warren St., Suite 209, in Glens Falls is a place where people can go to seek assistance with everything from depression to Post Traumatic Stress Disorder (PTSD) to family counseling. “We knew early on that we wanted to go in to practice together and talked about it for a year or so, planning and checking out office space,” said Karig. She said it has been about a year since the two have been in private practice together and recently they were able to expand. “Krystal and I both feel very blessed at the support we have received from agencies and people in the community who have helped us to get our practice off the ground. We feel good about our first year in private practice together and we are very excited our practice is heading,” said Karig. As a result of an expansion at their location, they now have the opportunity to begin offering group sessions, as well as offering health and wellness classes. “In addition, we are hoping to have some other clinicians and holistic practitioners join us for a well-rounded resource for the community,” said Karig. Turning Leaf specializes in counseling for children, teens, and adults for a variety of issues including anxiety, depression, PTSD, trauma, Attention-Deficit / Hyperactivity Disorder (ADHD) and Autism Spectrum Disorder. They also provide couples counseling and family counseling. Karig said one important thing they want the public to know is that they work to provide a safe, non judgmental, comforting space for people to come and get some tools and guidance they are searching for. “We work to help them move past the things that have been preventing them from being able to move forward or to be the person they would like to be,” said Karig. The Adirondack Chamber of Commerce has planned a ribbon cutting for Turning Leaf Counseling Services on Jan. 30. Turning Leaf Counseling Services cam be contacted at 518- 338-3117.